For most Americans, the only exposure to Scandinavian—Northern European countries, including Denmark, Sweden, Iceland, Finland, and Norway—design is the nearest IKEA. The impression is not that far off. IKEA is built on the cornerstone ideals of Scandinavian interior design —the premise that beautiful and functional furniture should not only be available to the wealthy—which is why they use low-cost materials such as form-pressed wood, plastics, and enameled aluminum to mass produce highly affordable furniture. But there is much more to Scandinavian style than inexpensive home decorating. In fact, there is a historical and philosophical lineage associated with Scandinavian furniture and home décor. Emerging with Scandinavian social democracy in the 1950s, the design philosophy is built on the principles of affordability, simplicity, and functionality. Despite these potentially austere priorities, the Scandinavian home design is no less beautiful than their more expensive counterparts. Moving into the modern era, this design has progressed into a further minimal practice but maintains its dedication to craftsmanship. The modern Scandinavian interior design aesthetic embraces lighter wood tones, bare white walls, and generally neutral color pallets with sparing pops of bold color. If homeowners are looking to adopt this Scandinavian style in their interior design, they need only follow three simple rules: start with a white (or cream) base, stick to minimalist furniture, and add pops of color and contrasting design elements. If you are thinking of a home remodel, find out the cost of your project with our free home remodel cost estimator. The video below will guide you through the steps. The long dark winters of Northern Europe inspired Scandinavian designers to create the brightest spaces possible. 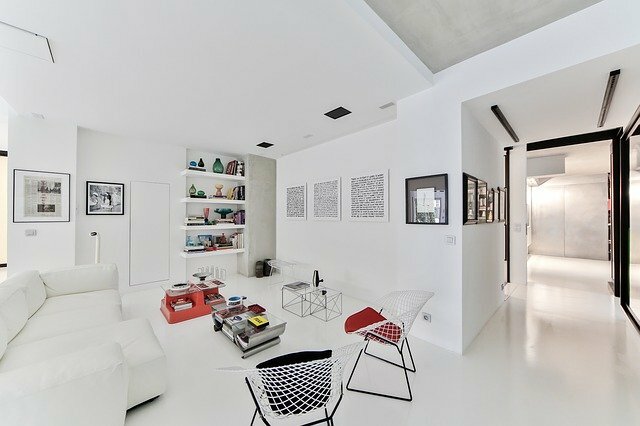 Because of this, the foundation of modern Scandinavian design is stark white, or sometimes cream, walls, and ceilings. Architectural details such as beams, columns, or countertops are often whitewashed to blend with their surroundings. When they are left exposed, they feature rich natural colors and materials, to bring in the feeling of being in nature. 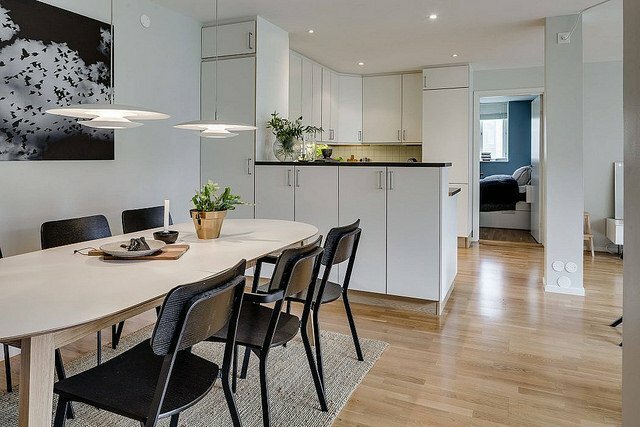 Scandinavian modern interior designs have also featured white or very light wood floors as well. This monochrome backdrop lets craftsmanship speak for itself, something that is of utmost importance to these designers. Starting with a blank canvas allows your other design elements to have a maximum visual impact. Also, it creates a bright and tranquil environment and makes the room feel large and open. Bringing in as much natural light as possible is essential. The idea of this warm Scandinavian interiors is to create homes that are open, airy, and have a flow that makes living in them easier and more pleasurable. Associated closely with minimalist, Scandinavian furniture seeks to reduce the bulk of an object while increasing its functionality as well as its beauty. Survival in the north during the early-twentieth century required all objects to be functional and using minimal supplies to create. Over time designers began to see beauty in the necessary simplicity, giving emphasis to it while incorporating modern textiles. Contemporary art movements such as Modernism and Art Nouveau, which incorporated fluid shapes and took inspiration from nature, also influenced early-twentieth-century Scandinavian designers. The Dansk Mobelkunst Gallery, which specializes in rare works of Danish furniture from 1920 to 1970, states on their website that the originators of this design movement, “erased the distinction between works of art and functional equipment for everyday life.” The ideology of this design comes from local institutions, such as the Swedish Society of Industrial Design, which were directly influenced by the political movements of the time. The goal was the promotion of design that was easily accessible to the masses without stripping it of all beauty, which was truly revolutionary. This means choosing furniture with as few lines and details as possible, mimicking delicate nature-inspired forms. No ornate headboards or throne-like chairs in these spaces! This keeps the space feeling open and uncluttered. Furniture is typically placed against the walls for increased ease of movement. Additionally, many Scandinavian designs opt to use recessed or hanging lights so as not to clutter the floor of a space. Designed to honor historical craftsmanship, which made use of the materials at hand, natural materials such as wood and leather feature heavily in Scandinavian interior design. But modern furniture designers are taking advantage of more innovative textiles. Additionally, the modern minimalist design uses upholstered furniture as long as it still has clean lines. Typically this means no extra cushions or frilly embellishments. Blank white walls and sleek modern furniture could start to feel austere without this third important element of Scandinavian style. Influenced by the social art movements of the early twentieth century, Futurism, and Constructionism, the use of bold color was seen as a way to disrupt institutionalized art that was mainly controlled by the upper class. De Stijl was a Dutch art movement of the time that reduced everything to essential form and color—vertical and horizontal lines and primary colors. This influence was seen in everything from light fixtures to patterns on wallpaper and fabric. Adding pops of color, in the form of plastic furniture, pillows, or picture frames, allows homeowners to display some personality. These pieces should be small and placed throughout the space, to draw the eye to different parts of a room. Quirky elements include geometric wall art or patterned dishes. Plants or art that is nature-inspired also upholds the Scandinavian style dedication to celebrating the beauty of nature. The organization is key to achieving a Scandinavian look and also provides an opportunity to include color. A place for everything and everything in its place is the embodiment of functional, easy living spaces. Brightly colored or metallic baskets for story magazines or small items are both functional and visually interesting. It doesn’t get more Scandinavian than that! If homeowners are working with a space with few windows, mirrors can help spread out the natural light that is available. Scandinavian interior design is more than just a timeless aesthetic, with deep roots in both political and artistic history. The democratization of beautiful design revolutionized home decorating in the early-twentieth century. But you don’t have to be a socialist to enjoy the aesthetic. Those who value ease of living and functionality without the loss of beauty will feel the draw of this simplistic minimalist design philosophy. When it comes down to it, clean lines, open spaces, neutral colors, and lots of light will never go out of style. Thank you! We appreciate you taking the time to read it and comment. Scandinavian design is definitely one of our favorite’s! Smeg. Hideously expensive. Absolutely worth it. The pop of color and vintage charm are definitely worth it. Form and function at its best! Thanks for letting us know! There’s an ongoing discussion about this, and we’re doing our homework to clear it up! We appreciate you taking the time to comment. Your article was my introduction to Scandinavian Minimalism. It’s what I’ve been looking for. Thank you for the thorough and concise guide. Thanks so so much for article sharing !! When it comes to manufacturing handicrafts and embroidered products, a few countries match up to the Indian artistic acumen, designing abilities and a sense of balance in color and texture. Over the passage of time, the Indian handicrafts industry has taken rapid growth strides, emerging as a major source of revenue for country’s economy. Subsequently, gifts shows like the Delhi Trade Fair 2011 has gone a long way in providing that extra spur in the course of development of the Indian handicrafts exports.